A stricken oil tanker, sticky oil slicks and seabirds soaked with oil – we all have seen such appalling pictures. Fortunately, such disasters are quite rare, if however a tanker runs aground or breaks apart the consequences are often catastrophic. Port state controls’ goals are to avoid such accidents, improve ship safety and single out “substandard ships”. 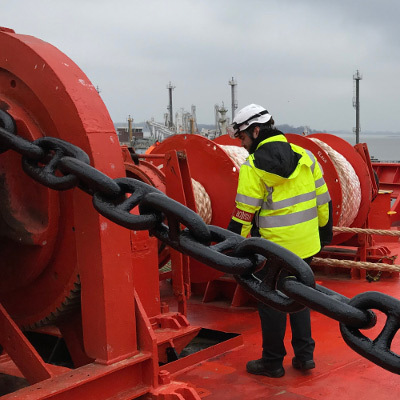 During these ship inspections specially trained officers check in ports if shipowners, flag states and classification societies abide to the international provisions of ship safety, protection of the marine environment and the requirements for working and living conditions of seafarers. In German ports, port state controls are conducted by the Ship Safety Division of BG Verkehr. The primary base for their work is the Paris agreement on port state controls, which is called the Paris Memorandum of Understanding (Paris MoU). With this agreement by now 27 member states undertake to conduct port state controls in accordance with unified provisions. The Paris agreement on port state control, which is in existence since 1982, has been a model for similar treaties all over the world. Current information on port state control can be found under “Documents” under the heading “Port State Control”.